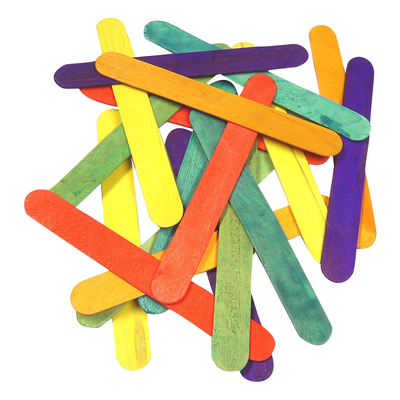 Create brightly coloured models or collages of beauty with our Gompels Assorted Colour Lolli Sticks Jumbo. Developed for use by all ages but most suited to nurseries and primary schools, this large pack provides 1,000 individual sticks. In an assortment of vibrant colours, each lolli stick has been made from a high-quality wood which allows it to be painted or glued easily. The jumbo size of each stick makes them ideal for use with smaller children or those dealing with dexterity issues. For the most flamboyant of artists, these colour lolli sticks can also be used to spread adhesives or stir paints together - the choice is all yours. The quality finish eliminates the risk of splinters when used whole while the large pack size can be easily distributed throughout your class or kept to one side as replenishment.